In a lot of situations, you can ignore the grammar and (if you know the vocabulary), guess the meaning from context. The same goes for speaking! If you use the wrong grammar, but the right words, the person you are talking with will probably know what you mean. So, you should start by focusing on the grammar that has the biggest effect on meaning. You can learn the more subtle points later. Verb conjugation is frequently the most important grammatical element in a sentence. It tells you who is doing the action and when. Same goes for "wysłałam pakiet w środę" - I sent the package on Wednesday and "wysyłam pakiet w środę" - I'm sending the package on Wednesday. Although, there are often more clues related to time, for example: in five minutes compared to five minutes ago or już versus jeszcze. So, verb conjugations should be one of the first things you learn! However, I don't recommend trying to memorize a whole verb table at once. Begin by combining a few persons (for example: I, you and he/she/it) with a few common verbs in the present tense. Once you get used to the pattern, add more persons. Eventually, you can begin studying the rules for past and future tenses. In total, Polish has seven cases. All of them are necessary to speak Polish 100% grammatically. But not all of them are equally common! yelling across the room at your friend ("Hej, Kasiu!" - Hey, Kasia!). The dative case, while not uncommon, is used almost exclusively with pronouns or people. There are only a handful of verbs that could require it for an inanimate object (ex. "przyjrzeć się"). The accusative case is extremely common because it denotes the object of the verb. But context and word order (which is commonly the same as in English) usually give enough clues, so you can get by without it in most situations! You will eventually need to learn all the cases. But you should start with the ones that are most commonly used and most important to meaning! Not only is the genitive case ("dopełniacz" in Polish) the most common, but it also gives the fewest additional clues when used to show possession. with most prepositions: "od Davida" - from David, "u Davida" - at David's (house), "obok Davida" - next to David, etc. ... and in many other situations. If you learn only one case, that case should be the genitive! I recommend using simple exercises with answers to help learn the rules. Seeing the rules isn't as instructive as trying to apply them, then getting correction. You can find these exercises in any Polish textbook. Again, remember that the rules are just tools! Memorizing the genitive case rules doesn't mean you'll be able to use it correctly in practice. It will take a lot of exposure to the language before you can do that. What do you think? Is this good advice for someone just starting to study Polish grammar? Do you have any additional advice? Write a comment! To bardzo ciekawa piosenka. Też interesuje mnie Rosja, uczyłem się rosyjskiego przed tym, jak zacząłem uczyć się polskiego. W wolnych chwilach czasem czytam o innych językach słowiańskich, czasem staram się czytać artykuły na Wikipedii napisane nimi, itd. ;-) To dobra zabawa kiedy nie mam niczego innego do zrobienia (co teraz się zdarza bardzo rzadko). "when a verb is negated or something isn't there: "Nie lubię mleka" - I don't like milk, "Nie ma Kasi" - Kasia isn't here"
I allways ponder over that that we use the accusative when something exists, but the genitive, when it isn't there. If my memory serve me well it's a vice of Polish language only, that doesn't appear in the Czech. Did you have troubles with this when you were learning Polish? It's something that happens in Russian too, but not as regularly as in Polish. Oh my God, I've written phonetically the word "vice" as "vais". I'm sorry I'm a dyslexic. One side note, you could emphasize the word that is the subject of an example, like with "Mleka" in one example. That's a good idea about emphasizing the word which is the subject of the example. I'll add something in a moment! We kindly invite you to visit our language school in Wrzeszcz - Gdansk. Nice environment, good teacher and good prices. I appreciate that you want to attract foreigners to your school and, yes, foreigners interested in Polish do come here. But posting such a comment without contributing to the conversation is just free advertising for you and not very fair to my readers or to me. Cześć! I have been leaning Polish for almost 2 years, and at times I feel discouraged by the difficulty of the grammar. Today some kind gentlemen from my circle of native Polish speaking friends directed me to your blog. All of my Polish speaking friends tell me time and again that I should not worry about the grammatical rules as much as building my vocabulary, and insist I am learning very well. Your articles explained this reasoning more clearly and I have a renewed enthusiasm about my own progress. Dziękuję bardzo! I'm glad I could help! Best of luck in with your Polish! Looks like excellent advice there David, and thank you for it. It's obvious in a way, considering the amount of explanation it gets in all the texts. Like so much of the obvious, it still needed to be stated ! ! ! Having drifted in and out of basic Polish for the last six years, I'm finally making a determined commitment to nail this language down. Reason - a Polish wife with a wonderful extended family. Just got back from a week there, and am sad I couldn't participate more. Not fair on my wife having to translate all the time, and they are really great people. They love the few words I have. Have tagged your page as a favourite - many thanks again ! Thanks for the comment! :-) Nothing compares to getting to know someone in their native language. Hi David, your blog is really great :) my boyfriend is Polish and I tried to learn some Polish for a few months about a year ago as we were going to visit his parents who don't speak English. I used an website which had 'lessons' - it was quite good but not very practical (being able to say "this is a large blue table", for example, was not something I could use!). Consequently I found I could barely say anything and it was incredibly frustrating. We are going again this summer and I really want to be able to have some form of conversation with his parents. Being a language learner myself (I'm studying French and Spanish at university) I understand how languages work and I think I understand the basics about how the Polish grammar works. However, having never studied German/Russian/Latin etc. the concept of cases is new to me. How do you think I should go about learning them? Considering I've only got a couple of months, do you think I should just try and learn the genitive? If so, do you have any useful tips/could you perhaps give me a table of endings? I can't find any SIMPLE grammar overviews, everything I've found is in so much detail it's difficult to know where to start! Also, how would you advise going about learning verbs? I'm thinking of making some flash cards of all the common verbs in the present tense. I'd really like to do ones for past/present/future but then there's the problem of aspect, and I don't think fitting 5 conjugations on 1 card would be very helpful!! Thanks in advance and sorry for the essay! That's awesome that you're going to Poland and that you'll have family to interact with. That's a great motivation! I'd say to stay away from heavy conscious study of the grammar until you are a little conversational. It'll be hard to entirely ignore verb conjugations though. But again, like I said - starting with direct study of grammar is a bad idea. 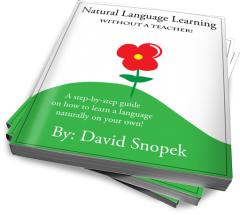 If you'd like to find out exactly how I learned Polish, I recommend my ebook! "This time I'll pay for the beer, ok?" powinno być przetłumaczone na "tym razem JA zapłacę za piwo". Bez "ja", to zdanie sugeruje, że osoba je wypowiadająca nie zapłaciła za piwo poprzednim razem. W drugim zdaniu ten sam błąd. To jest samochód Dawida - nie powiemy "od Dawida"
Dostałem to od Dawida - tutaj uzyjemy "od"